Need a Current Account? Apply here! Need a Credit Card? Apply here! Need a Savings and Investment Account? Apply here! Need a Personal Loan? Apply here! Excludes: Business Mortgages and Commercial Loans. 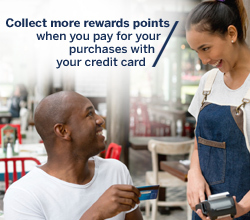 Only loan accounts with debit balances qualify to collect tiering points. Need a Home Loan? Apply here! Need Vehicle and Asset Finance? Apply here! Note: Only the above listed products underwritten by Standard Insurance Limited or Liberty Life will qualify for tiering points. TravelWallet, Foreign Notes,MoneyGram and Shyft. Qualifying Shyft transaction: Purchase to the value of R 7500 or more of foreign currency directly from your Shyft ZAR wallet in a 12 month period. Hold an active FICA compliant Online Share Trading account with a credit balance from the Standard Online Share Trading Platform. Qualifying trades include both buying and selling of Equities and/or buying and selling CFDs (Initial margin value is measured). Draft a Will through Standard Bank, nominate us as the Executors and allow us to keep the original will in safe custody.